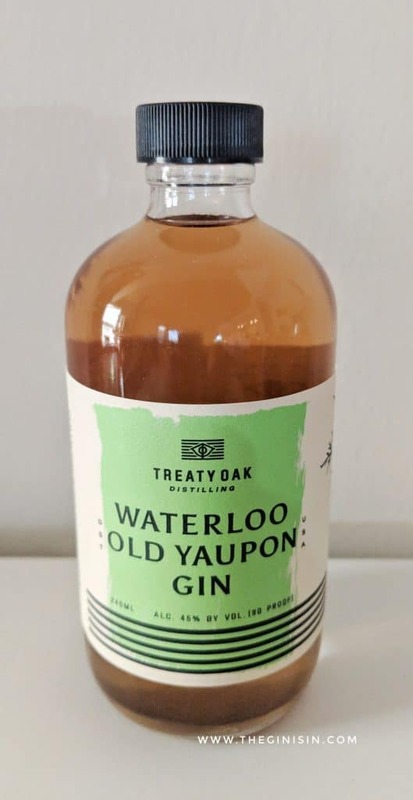 Distillery: Treaty Oak Distilling Co.
Waterloo Old Yaupon Gin is Treaty Oak’s take on the Old Tom style. It begins from a base spirit distilled from grain— similar to Treaty Oak’s Waterloo and Waterloo Antique— Old Yaupon Gin adds some unusual botanicals and is sweetened with wildflower honey. Most intriguing of the botanicals in Old Yaupon Gin is the one in the name. Yaupon holly, often simply referred to as yaupon is the only native North American plant to contain caffeine. It was widely consumed by indigenous American peoples pre-European settlement. Yaupon grows rampant in its native range, spanning from Texas to the Carolinas across the gulf coast. It’s widely considered a pest by farmers and ranchers; however it’s been making a comeback as a beverage. Similar to the Eat the Invaders movement which suggests we can eat invasive species into submission— Yaupon tea is widely available. And Waterloo Old Yaupon Gin is the only gin I know of which contains this unusual botanical. The gin is a pale peach in hue. To the nose, Old Yaupon has a dusty, citrus and herbal character. The vivid aroma of Makrut Lime leaves starts quietly, but becomes bolder with time. Lemon verbena, lime leaves, grapefruit pith, and lime zest oil all are present. On the palate, Old Yaupon Gin is easily among the boldest botanical bouquets I’ve tasted in a gin. It rapidly explodes with intense notes of lemon and lime leaves. Mentholic at first, it becomes much more camphorous on the palate as the flavor evolves. Notes of spruce tips and pine tar bring juniper to attention. It’s only slightly sweet, with a pleasant hint of dark honey. The finish is more tannic than sweet however, with a fair amount of astringency. The balance of sweet and herbal though reminds me far more of something like Pomp and Whimsy Gin Liqueur than any other Old Tom I’ve tried. …and that’s where Old Yaupon Gin becomes a bit complicated to me. The bold botanical profile is dominant in any cocktail application. Old Yaupon’s botanical choice is unusual and exotic, meaning that there’s not really any cocktails that have been designed for a gin like this one. A couple options though. I think that it works well in an Old Fashioned style application with bitters and an orange zest. Furthermore, it also pairs well in a Hot Toddy— lemon and warm water even make it something alike an herbal, citrus tea. One final recommendation, if you’ve got some Pecan Simple (or perhaps Pecan Orgeat) around, the Lost Pine cocktail is one suggestion from the folks at Treaty Oak. But in general, Old Yaupon Gin is a gin that should be considered to be its own thing— rather than plugged into cocktails, Old Yaupon must have cocktails planned around it. As an Old Tom style gin, Old Yaupon Gin is rather unrecognizable. But as a riff on it, it’s worth a closer look— Treaty Oak has paired some unusual flavors and created a spirit which has no peer on the shelf today. It is truly its own thing. But with forging into new territory comes risks. Bartenders will find it a very difficult spirit to play with. It demands individualized attention. Secondly, I think that the appeal of Old Yaupon may be rather narrow. If you’re looking for a sweetened, camphorous, herbal sipping spirit— this is your thing. But for everyone else, this is one I recommend trying first because metaphor and categorization don’t lend itself to Old Yaupon Gin very easily.